An opportunity to acquire a beautifully constructed house in a very desirable and sought after location set over 3 levels with 4 / 5 bedrooms, 3 bathrooms, basement, roof terrace and integral garage. An opportunity to acquire a beautifully constructed house in a very desirable and sought after location. The owner will consider a part exchange. 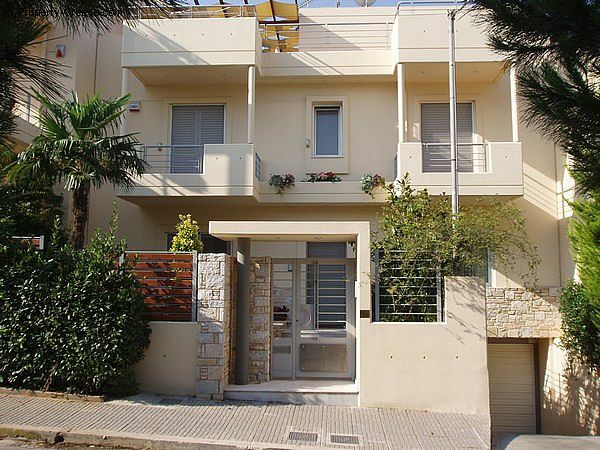 This luxurious maisonette in Pigadakia, Voula is located on the best road in the area. 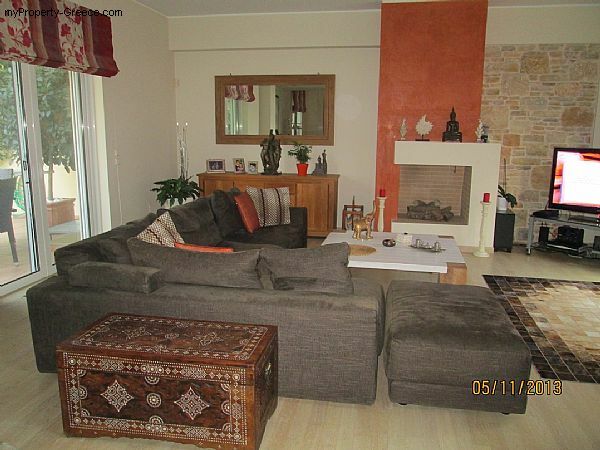 The property is of traditional construction and has a small garden to the front and rear. 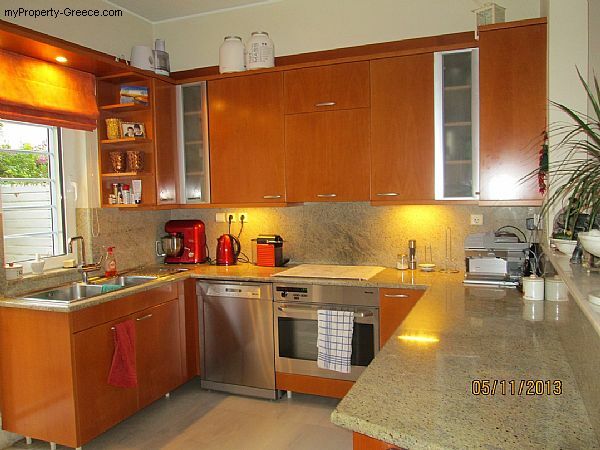 Briefly, this property consists of about 240 square meters of built areas with 4 / 5 bedrooms and 3 bathrooms. The property has balconies to the front and a large roof terrace. It is set over 3 floors and has a basement for storage, plus an underground garage for one car. The ramp to the garage provides parking off-road for a second car. The property was built in 2000 and is in immaculate condition. The ground floor comprises living / dining room and kitchen. The entrance door is a high quality security door made of steel and opens in to the living room. The living room and dining room are open plan enhancing the feeing of spaciousness. The living / dining room has a wooden floor and built in fire place. Large sliding doors to the front and back of the living room open to the front and back garden. The kitchen has been designed and made to top specification with high quality cooker, fridge, dish washer and microwave. The work surfaces are of high quality granite. 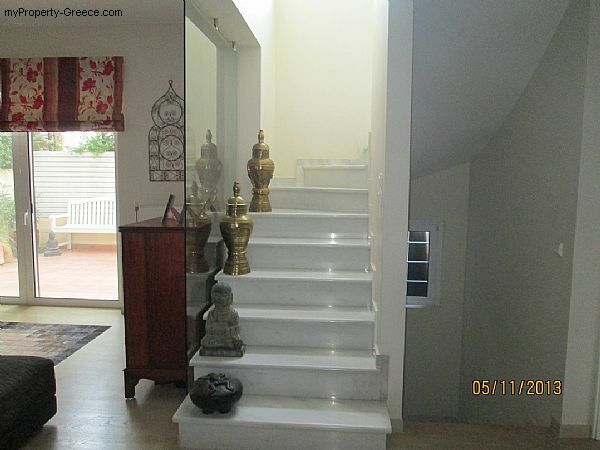 A white marble staircase leads to the first floor. The master bedroom is located at the front of the property with a sliding door leading to a balcony. The bedroom has built in wardrobes allowing for plenty of storage and hanging room. The bedroom is air-conditioned and has wooden floors. The Master bedroom has an en-suite bathroom which includes a toilet, wash-hand basin and shower cubicle. A spacious bedroom located at the front of the house. The bedroom has a sliding door leading to a balcony. The room has built in wardrobes, wooden floors and is air-conditioned. A spacious bedroom located at the back of the house. The room has built in wardrobes, wooden floors and is air-conditioned. 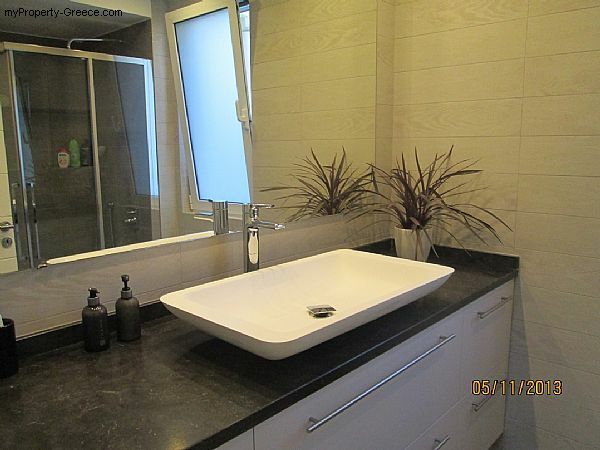 The bathroom has been fitted with a toilet, shower and wash-hand basin with a large marble top. The bathroom has a window and has been tastefully decorated. The marble staircase leads to the 2nd floor / roof terrace. There is a large room which is currently used as a bedroom. The room has sliding doors leading onto a large terrace. On this floor there is also a small utility cupboard for the washing machine, etc. The terrace is tiled and has a pergola providing shade to the main area. The basement has a large room with a small window and built in cupboards which can be used as an additional bedroom, storage room or office. The bathroom has been fitted with a toilet, shower cubicle and wash-hand basin. The bathroom has a window and has been tastefully decorated with tiles. The garage can accommodate one car and has an up-and-over electronically operated door. The ramp leading to the garage can accommodate one additional car off road. The basement also includes a utility room for storage, 2 rooms which house the oil storage container and heating boiler. The heating is oil fired and radiators have been fitted throughout. All windows are made of aluminum and are double-glazed. Solar panels are located on the roof for heating of water. The house is wired with an operating alarm system. Security sensors located outside provide additional security.